Are my donations tax-deductible? Yes, we are a 501(c)(3) organization. Donations are tax-deductible to the full extent of the law. Visit the IRS website for more information. How do I donate? Do I need to make an appointment? We accept donations during our open store hours and no appointments are necessary. We do ask, when possible, to drop off at least 3o minutes prior to closing so we are not rushing around at the end. Visit our How to Donate page for more information. What brands and types of items do you accept? We accept almost everything you’d find in a home or on a patio, and just about any brand and item that is in good condition. To facilitate the processing of items, we request that you not donate items that are broken, stained, torn or damaged. Refer to our Donations We Accept page for information about items we can and cannot accept. What items do you not accept? There are a few items we are unable to accept due to low demand, safety & liability issues, regulations or space limitations. Please review our Donations We Accept page to learn what we cannot accept. What if I donate something you can’t use in your store? All items are reviewed to determine if they meet our quality standards and are items that will sell in our store. Any items that we are not able to sell in our store are donated to another charity or discarded if they are damaged or broken. Do you offer pick-up service of donations? We currently pick up large furniture items within an 8 mile radius of our stores in Avondale Estates, dependent on current resources and the weather. We do not have the resources to pick up smaller items at this time. We have made exceptions to the radius for larger donations (i.e. an estate sale). Please visit our Large Furniture Pickups page for more information. Can I consign my items instead of donating? As a non-profit organization dedicated to helping homeless pets, our focus is on raising funds to succeed with our mission. We are not in a position to consign any items at this time. You may donate your items for a tax donation and know that proceeds are used to help give homeless pets a second chance at life. What is your return policy? Items may be returned for Store Merchandise Credit within 10 calendar days as long as the original tag is attached and the original receipt is presented at the time of the return. Items without a receipt cannot be refunded or exchanged. We reserve the right to refuse returns if the item has been damaged or has been visibly worn or used after purchase. Where are your 2 stores located? Our stores are located next door to each other, sharing a parking lot, in downtown Avondale Estates. We are 1/2 mile from the DeKalb Farmers Market and just 2 miles from downtown Decatur, I-285. Find our more on Our Stores page. How do I sign-up to volunteer at Second Life? Visit our Volunteer page and fill out the Volunteer Form. Our Volunteer Coordinator will try be in touch with you within 3 business days. You may also call our store at 678.974.5671 and talk to our Volunteer Coordinator. Thank you for your interest in helping us give homeless pets a second chance at life. 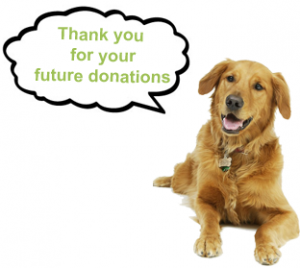 How much money is donated to the animal charities? We are a non-profit organization and operate per IRS regulations. Our goal is to donate up to 70% or more of our net proceeds. Visit our Our Mission & Charities page for current information! How are the charities selected? Organizations are selected based on their mission. It is our intent to provide cash grants to many organizations, as well as for specific situations in which funds are needed (i.e. special medical funds, senior pets, emergency requests, etc). If your non-profit organization is interested in becoming a potential grant recipient, please fill out our Grant Application Form and follow the instructions on the form. 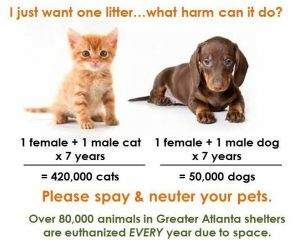 Where can I find a low cost spay/neuter clinic? Thank you for being a responsible pet owner. Spaying/neutering your pet is one of the best things you can do to reduce pet overpopulation – and it is healthier for your pet too. To find resources close to you, visit our Low Cost Spay/Neuter page. I’m interested in adopting. Where should I start? A great place to start is Petfinder.com. This website offers a database of thousands of animals in shelters and with rescue groups and you can search on many criteria. To find local shelters and rescues for adoption, visit our Find a Rescue or Shelter page. Thank you for adopting and saving a life. I can no longer keep my pet. Can you help me find a home? Unfortunately, we are not in a position to offer rescue for owner surrenders. We believe having a pet is a lifetime commitment. This decision should not be taken lightly, and it is very difficult on the pet to be taken away from its home. Have you considered all options, including training and reaching out to friends and family, before you make this move? There are organizations that can offer assistance for struggling families. If you must take this step and are committed to finding the pet a home, you will need to contact numerous rescue organizations in the Atlanta area, visit local PetSmart’s, Petco’s and other adoption locations during adoption events to ask for help. You are welcome to place a flier in our store. Network with your friends and family. Share on your Facebook page. Your last resort should be taking the pet to a county shelter, as your beloved pet could be euthanized that same day.